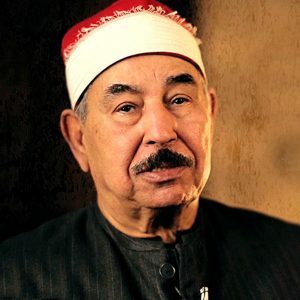 Mohammad Mahmoud At-Tablawi is an Egyptian Imam and Qur’an reciter. He was born on 14, November, 1934 in a village called Met `Uqbah, Egypt. At the age of four, Sheikh Mohammad started memorizing the Qur’an and completed its memorization at the age of ten. In 1956, Mohammad earned a degree of Al-Azhar’s Recitations. At the age of 15, he gained much popularity as reciter and gave his voice to the Quran in gatherings organized by notorious Sheikhs of Egypt. Recommended by Sheikh Abdul-Fatah Al Qadi and Sheikh Al-Ghazali, he joined the Egyptian TV Channel in 1956. Shortly, he earned a wide recognition and became of the most listened reciters either across Egypt or beyond. Thus, he was as much popular in Saudi Arabia. Mohammad At-Tablawi often organized recitation evenings and debates over different issues of Islam for the purpose of enhancing the participation of young people the Islamic movement and thinking. Best known as the golden voiced reciter, At-Tablawi has recited for notorious personalities. He recited the Quran during the funerals of Jordanian king, Al Hussein’s mother, the late Moroccan king, Hassan II funerals and Hafez Al Assad’s son, Bassel funerals. He has released many cassettes and videos including his recitations.